Turbo Air Ventilators driven, they are used worldwide because of their low capital cost, zero running cost, adaptability, high capacity per vent and overall reliability.Constructed with stainless steel and aluminum including the base plate, these are extremely strong with life span lasting generation & products are completely weather proof and maintenance free. The product has unique stale air extract capacity and is able to work under hazardous conditions. 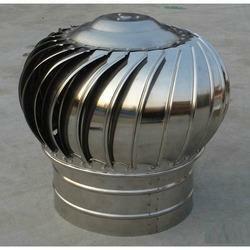 Looking for Turbo Air Ventilators ?